Living higgledy piggledy as they do, New Yorkers know how to take maximum advantage of every spare inch of space. Writing by the kitchen window in our second-floor Brooklyn apartment, I spy oases of green amid the patchwork of our neighbours’ rooftops. From the odd potted herb to lushly overflowing rows of bedded vegetables, there’s plenty of creative gardening going on. Having bought some herb seedlings at the farmers markets a week or two ago, one look at their straggly yellowing leaves told me I could no longer put off repotting them. 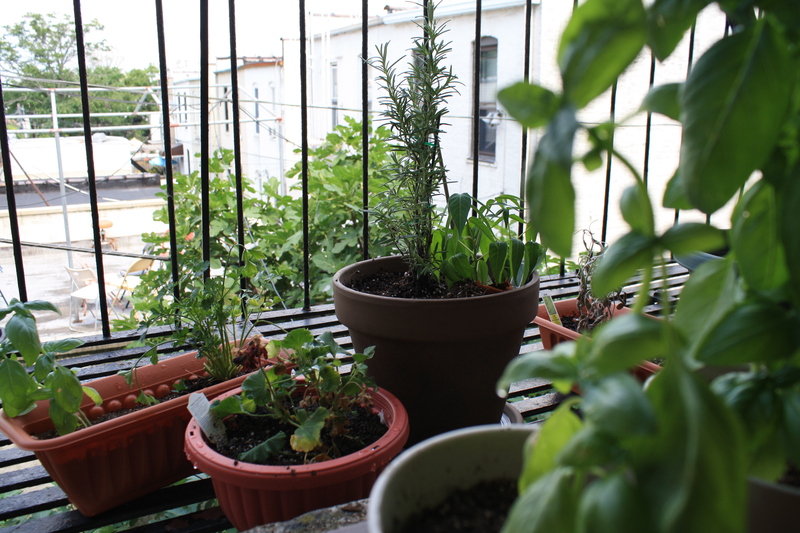 So I set about making my own little kitchen garden on the fire escape, conveniently (or inconveniently, if you’re actually fleeing a fire) located in the window above the stovetop. It may be too late to save my sage and it looks like my chives might have already died too, but I think there’s hope for the basil and parsley, and you can’t kill rosemary with a stick. I left some space for thyme (essential for roasts), coriander (essential for asian and mex cooking) and mint (essential for mojitos). Some day I’d like to rig up some fairy lights and take a glass of wine and some nibbles right out there on the fire escape, like the world’s most cramped balcony bar. Summer nights are so much more chilled (in every sense) when you don’t have to turn on the stove. We’ve been feasting all week on cool salads, most of which I prepped in a minor frenzy on Monday night. This Vietnamese-style chicken and cold rice noodle salad was a total hit and luxuriously plentiful – only becoming more flavourful as a leftover, and only just tipping into soggy territory nearly four days later. I’m finally experimenting with more grains – this barley ratatouille salad has been rather lovely, I found some gorgeous Israeli couscous at the local organic store, and I’m also eyeing off these quinoa recipes by the people from Poor Porker. Whether you’re into music, film, theatre or dance New York has an embarrassment of riches in the summertime. On Tuesday night we loaded up our bikes with a picnic blanket, tupperware’d salads, cheeses and ham and French bread, and a couple of baby growlers from favourite local bar the Double Windsor, and listened to Wye Oak and Dirty Projectors play in Prospect Park. It’s so amazing to live just blocks away from such a huge park, particularly when they have an impressive summer program of free performances. Tuesday’s was a benefit show, but even if we couldn’t see the bands, the sound quality was still incredible for those of us mooching without tickets outside the bandshell. When you don’t have a backyard to call your own, you’ve got to take pleasure in going barefoot in the grass when you can. We listened and lolled as fireflies sparked in the dusk around us, counting the many blessings of a Brooklyn summer.